September 12, 2016 – It’s important to actually walk the earth where a given historical event occurred. This week, we’ll do just that at the Paoli Battlefield Historical Park & Paoli Memorial Grounds, just under an hour west of Philadelphia. Our guide is Jim Christ, vice president of the Paoli Battlefield Preservation Fund. 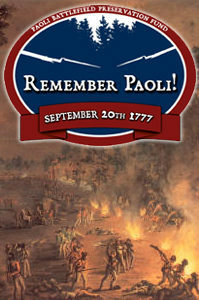 The Battle of Paoli, also called “The Paoli Massacre,” unfolded at midnight on September 20 to 21, 1777. After General George Washington’s defeat at Brandywine on September 11th, his forces retreated toward Philadelphia to regroup, and he ordered General Anthony Wayne to harass the British. But the attempt failed, and the result was the 9th deadliest battle in the American Revolutionary War. You can surf this unique historic destination on the web at PBPFinc.org, or by following @PaoliBattle on Twitter. You can also like the Paoli Battlefield Historical Park’s page on Facebook.